~from Sonia Faleiro’s review in Tehelka. For a while I haunt the dirtiest bakeries and tea-stalls I can find. I search for her, my sweet great-grandmother, in plate after plate of stale confections, in needle-sharp green chillies, deep-fried in rancid oil. I plot her revenge for her, I give myself diarrhoea for a week. And suddenly, there it was, in every shop window. The White Crusty, the Sliced and the Unsliced. The small Tin, the Large Tin, the Danish Bloomer. The abandoned, plentiful promiscuity of it. The soft pillowy mattressiness of it. The well-sprung bounciness of it between your teeth. Hard crust and soft centre: the sensuality of that perfect textural contrast. I was done for. In the whorehouse of the bakeries, I was serially, gluttonously, irredeemably unfaithful to all those chapatis-next-door waiting for me back home. East was East, but yeast was West. So under Haasan’s ideological direction we had tomato soup with croutons, jellied hooves, mutton dosas, biryani, fish curried in mustard oil, prawns in coconut milk from Haasan’s time in Malabar, potatoes in a thin gruel of haldi and dahi and water, free of garlic or onions–Haasan generously wished to include a sample of vegetarian bigotry–which no-one ate, and finally, custard. Ammi and I were against the custard but Haasan insisted. Not that he liked custard–he was simply asserting our right to be Anglo-Indian. In the dark leafy back garden that encircled the kitchen courtyard were neem, guava and bel trees. There was also an amra tree, another fruit that hung in the cusp of town and country–it hasn’t survived big cities and branded fruit–a green, sour fruit, with crisp white flesh that encloses a thorny seed. It could be made into chutneys but was tastiest raw, dipped in rock salt and chilli. Amra and kul-scented afternoons were the domain of women and children. 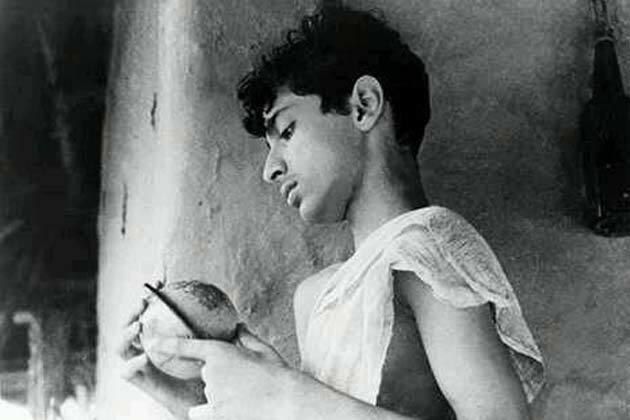 In Pather Panchali, young Durga and her little brother Apu steal a bit of mustard oil and salt from their mother’s scanty supplies to make themselves a raw mango chutney, out of mangoes stolen from a neighbour’s orchard. The episode has all the thrift and danger of a bank robbery. Mid-afternoon licks of amra and kul always had that tinge of the illicit, a guilty union of self-indulgence between adult and child, whether the fruits were stolen or not. In the next lane, a puja was being held in the house of a rich man. When darkness fell, Apu could see a large number of guests going into the house to have dinner. What if…what if he slipped in with them? It was such a long time since he had been to a big dinner. Could he do it? Who would recognise him anyway? Apu stood in his balcony, swinging between temptation and fear.